Full HD 1080p @ 30fps. Loop recording, auto power on/off. When you first hold the camera you realise just how small and light it actually is with an excellent build quality - it feels very strong and sturdy, more than enough to cope with even the worst drivers out there! 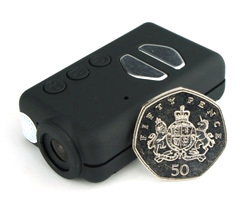 It's by far the smallest dash cam on the market and one of the cheapest. There's no official box with the camera and there isn't any instructions or software provided. However, you can download some Windows software to change the camera preferences and a PDF user manual created by third-parties (see download links below). Without the software, you can change the camera preferences by editing a text file on the memory card - it's easy enough but can appear a little daunting at first. The Mobius camera comes with lots of mounting options allowing you to mount it in the car with a suction or adhesive mount, depending on your preference. If you want to use the camera for other activities such as cycling or even snowboarding, you can purchase additional mounts. The camera mounts using a standard tripod thread which means you can use any mount with the tripod thread connection. I've actually been using the little Mobius camera in my car for a few months and absolutely love it. During this time the manufacturer has released half a dozen firmware updates which improves reliability and adds new functionality. I've not had a single problem with the camera in the 3 months I've been using it and it has even captured an accident. On a 16GB MicroSD memory card you can get around 2 hours of video at the full 1080p 30fps high quality setting. You can obviously get more if you reduce the quality down to 720p but you need the full HD to get the best quality footage available. The manufacturer recommends a class 6 memory card but I've been using a class 10 card without problems. When you open the software you'll notice that there's lots of camera settings to play with. It's worth having a play with the settings and trying the different options until you're happy you have the best quality video for how you use it. Like many dash cams, it comes with High Dynamic Range (sometimes called Wide Dynamic Range) which improves the video quality in low-light or at night time. 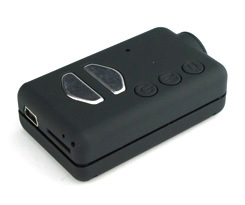 This can compromise the standard video however, since more noise is added to the video. If you rarely drive at night, then it's best to leave this feature off. After a recent firmware update, motion detection was added to the camera features. This works well but you cannot have motion detection running alongside normal recording. 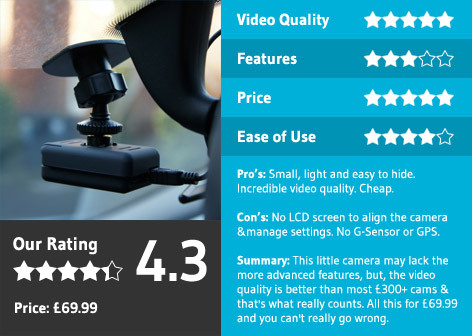 Unlike most dash cams, where the motion detection normally kicks in when you have parked the car, you will need to run the camera with motion detection on all the time which means you may miss out on footage whilst the car has stopped. It's good to see the manufacturer releasing new firmware and features though - perhaps motion detection will improve over time. The camera does lack some of the advanced features offered by other dash cams such as GPS maps, LCD screen, speed tracking, or a g-sensor. Event recording is not automatic (normally a g-sensor will automatically sense an impact and lock the video file) but there is a button on the camera which you can press to lock a file. This isn't a feature I've ever used (I always forget which button it is!) so if you need to save a video file you can just stop the camera before it loops and overwrites the footage you want to keep. Whilst it does lack some of the advanced car camera features, the quality of the full HD 1080p video is astonishing and trumps the top of the range £300+ cameras. It really is excellent both during the day and at night. So, if you're looking for a small camera which takes exceptional video without the extra features this is the perfect camera. The Mobius ActionCam is available to buy online for only £69.99 which comes complete with all the accessories you need to mount it in your car. It's also pre-configured with the latest firmware and with all the settings required to make it a perfect dash cam.